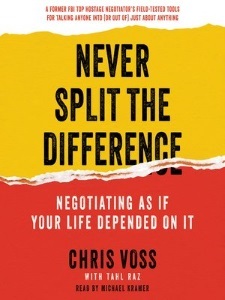 My new favorite book is Never Split the Difference by Chris Voss. I've been recommending it to everyone and have bought it for a few people as well. It's that good. Below are my notes and highlights, but they don't even begin to do the book justice. You really can't appreciate Voss's genius without all of the great stories he tells — especially the ones from his days as an FBI hostage negotiator. The stories bring all of his insights to life and make for a very enjoyable and entertaining read. Get the book here on Amazon. Avoid “I” statements and use the neutral phrasing above instead. Mirror. Repeat the last 3 words or critical 1-3 words of what was said. Stay silent for at least 4 seconds to let the mirror work its magic. Slow. It. Down. Going too fast is one of the most common negotiating mistakes. Put a smile on your face. Positivity works! Don’t feel their pain: Label it. Labeling is a way of validating someone’s emotion by acknowledging it. Give their emotion a name to show you identify with how they feel. and say them before the other person can. Employ tactical empathy. Imagine yourself in your counterpart’s situation. You don’t have to agree with them or give them a hug. Empathy is not sympathy. Break the habit of attempting to get people to say “yes.” The word makes people defensive. Getting to “no” is more important in a negotiation. “No” makes the speaker feel safe, secure and in control, so trigger it. What if they won’t say “no”? Then you intentionally mislabel to force it. Strive for “that’s right” instead of “yes.” Use a summary/paraphrase to trigger it. When you get a “yes,” use the Rule of Three. Make them say it three times in different ways to ensure it isn’t counterfeit. The negotiating F bomb is “FAIR.” It is a very powerful word used three different ways. Use #3: To defuse the F bomb in advance. Deadline pressure and fear of loss are powerful negotiating tools. You can bend reality by anchoring a starting point. To ease a conversation in the direction you want, use calibrated questions. They make your counterpart feel in charge while it’s you framing the conversation. Be aware of behind-the-scenes deal killers, people you are not negotiating with who, nevertheless, have the ability to kill your deal. Pay special attention during unguarded moments: before & after formal meetings or during breaks, at events, etc. “I,” “me,” and “my” means the real power to decide probably lies elsewhere. “We,” “they,” and “them” means it’s more likely you’re dealing directly with a savvy decision maker keeping his options open. Black Swans are the hidden motivators in a negotiation. They are “unknown unknowns.” Voss believes there are as many as three of them in any negotiation. Leverage is about perception, not reality. It is an essentially emotional concept. It can be manufactured where it doesn’t exist. It doesn’t matter what leverage actually exists, what matters is the leverage they think you have. Set your first offer at 65 percent of your target. Have the courage to keep negotiating. Don’t accept a wimp-win deal where you jump a counterpart’s first concession. Positive leverage is your ability to give your counterpart what he wants. Whenever the other side says, “I want ...” you have positive leverage. Negative leverage is the ability to hurt your counterpart. It is based on threats. It gets people’s attention because of the psychology of loss aversion. Normative leverage is using your counterpart’s norms (rules of behavior, moral standards) to bring them around. If you can show inconsistencies between their beliefs and their actions, you have leverage. No one likes to look like a hypocrite. This includes working to understand the other side’s religion, meant literally (e.g. Jewish) or figuratively (their worldview). Review everything you hear from your counterpart. You will not hear everything the first time, so double-check. Compare notes. Use “backup listeners” whose only job is to hear things you miss. He’s ill-informed. When people have bad information, they make bad choices. Garbage in, garbage out. He’s constrained. He may lack the power to close the deal. Do a preparatory exercise before entering a negotiation where you list the primary tools you anticipate using, such as the labels, calibrated questions, etc.